Over the past little while Geoff & I have been changing around some of the artwork in our apartment. It seems to me that it's never been easier to find affordable art options, particularly when it comes to prints (to me "affordable" means under $50 -- but of course there are prints to be found for less, or more). I came across the work of Russell Leng via Little Paper Planes. The print on the right came from LPP, and the one on the right came from The Mammoth Collection. Both Little Paper Planes and The Mammoth Collection are great places to find unique, inexpensive pieces. You might remember my buddy Caitlyn from her cute apartment or as my Summer Water model -- this weekend she will be at City of Craft selling her original drawings, necklaces, handprinted totes, and cards as Lemonade. I'm looking forward to picking something up from her -- I love this drawing. 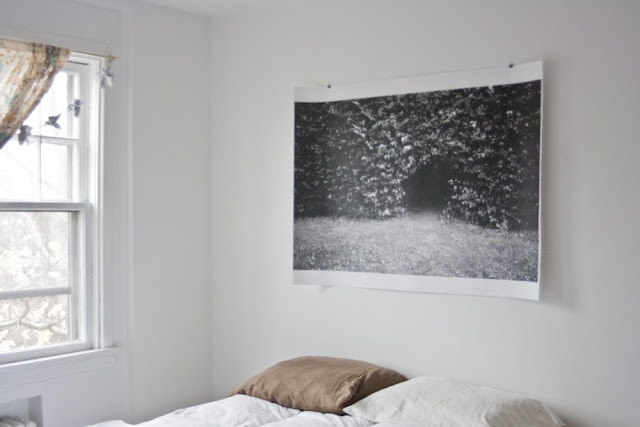 We hung the Passage poster from Atlantic Treefox above our bed (this isn't my bed; I couldn't get a picture this nice in my dark bedroom). Sweet Erin and I traded for it, making this the third print I've received from her as a trade. I love that we're able to do that, and I love having her artwork around me. She's a very special kitten, that one. Okay, this isn't art, but I'll probably display it as though it is. Francesca found this basket on eBay a few months ago, and I had it in my watched items list until the day that I broke down and ordered it for myself. Hilarious. Heather: Maybe one day I'll model them! Bianca: Yes! I'm so glad I gave The OC another chance. I stopped watching after the first season when it was actually on, but I'm really enjoying the second so far. erin jane / atlantictreefox: Yeah! Give those bangs some freedom! Also, makes your hair less oily, maybe. Siubhan: Haha, I love it too! It's such an excellent program. Celine: Apparently you can get recycled fur earmuffs at Vocado, made by a Quebec company! Bre: Thanks for the encouragement! Kate: Ha! Thanks! I'm pretty happy with how mine look, which is kind of weird since they just sit on the floor and aren't really supposed to look nice. I found little teethmarks in one of them -- looks like Pony has a new teething toy. SJ: I'll trade you winter for summer! marissa (stylebook): Thanks, Marissa! There is definitely something about winter that makes me more lazy than usual, but then I say that in summer as well! I hope you still take lots of time to snuggle up and be lazy, though -- it's pretty important. Cassidy: I hope you can find some! I'm definitely seeing them around more often. For a long time I thought they were just for kids! jen: Oh no! It was funny, I found these without really trying. I want to see your draft protectors! Sarah: Hooray! So glad you like it. olivia: Oh, that sounds like a great idea! Good luck with it! Let me know if you do it! hila: I wish I could send you some of mine! bigBANG studio: Ha! I agree, the fluffier the better! Emma at The Marion House Book: Thank you! Yes, your hat sounds lovely! Don't do what I did and drop it in the snow! Silver Falls: Ha, thanks! Thanks for being my earmuff piece supplier. What a deal! ilovesasek: Thanks, you too! I wonder if the snakes work... I hope so! I put a lot of faith in them to do their jobs! Katie: Ha! That does sound quite awful. I can be absent-minded but I also happen to be a bit of a control freak... don't get lost on my watch! I've been contemplating buying a Russell Leng print! So lovely to see them here and photographed in your space. i LOVE the first set of prints, and since my walls are still bare, i may definitely have to check into those. also, the passage print is gorgeous, and i love how it's hung without a frame in the picture. i've been meaning to get a picture of the art wall in bedroom where two of your prints now hang! Your apartment looks so beautiful in these shots, as always! Love those two Leng prints framed together! The Russell Leng prints are gorgeous! I wish I had a totally zen apartment to fit it in but my little apartment appreciates spurts of colors a bit more. I just purchased this http://www.etsy.com/transaction/40168567 and this http://www.etsy.com/listing/55258319/2-for-1-sale-the-odd-couple-8-x-10 yesterday. I can't wait to frame them up! oooh I love the Passage poster from Atlantic Treefox how do I get my mittens on one!? Thanks for the links - I really love reading your blog. Every post is totally interesting to me, and so beautifully photographed. loooooooove both of those crystal prints (+ your little holiday trees) both prints remind me of my new crystal buddy i had to scoop up at the gem rock + bead show last week. Beautiful finds! I'm moving to a new place and can't wait to decorate. Some work by Russell Leng might be just what I need! oh the black and white picture over the bed is just so beautiful!! That black and white print over the bed is simply gorgeous! I love the elegance and simplicity of it. I love your little lineup of trees underneath the artwork! So sophisticated and festive at the same time. The kitty bag is also very cute! I love the 1st image. You have some lovely pieces and some great suggestions. I love the pieces on your mantle. where oh where did you get those little chrismas treeees! i have a herd of tiny deer that would love some tree friends to hide in! I got those little trees at... Wal-Mart! They were really cheap but I think I'll have them for a long, long time.